NAMA won’t have been caught unawares by Sean Dunne’s bankruptcy application last week, though the specific timing of filing on Good Friday might have raised a wry smile; after all, NAMA has a reasonably intimate knowledge of Sean Dunne’s finances and ultimately, land that was bought for €84m an acre during the Irish boom, and is now worth €7m an acre at best, so unless Sean has hundreds of millions squirreled away someplace – for which there is no evidence whatsoever, incidentally – then the man is unequivocally insolvent. Of course the hunt may still continue to mop up what NAMA might see as loose ends, but Sean filing for bankruptcy was always a clear possibility. It seems that NAMA and other creditors have up to three months to object to the bankruptcy, and as we saw in the case of David Drumm in neighboring state of Massachusetts that, although he filed for bankruptcy in October 2010, he is still dangling in uncertainty, having upset the bankruptcy trustee and his main creditor, Anglo. 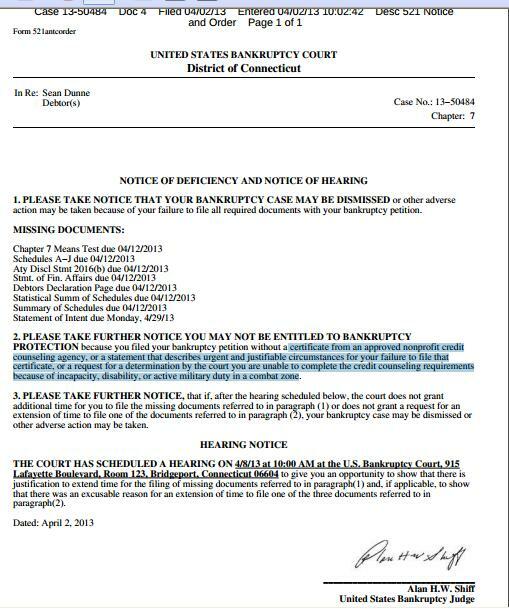 Sean himself has wasted no time in filing a so-called “Motion for Stay By Reason of Bankruptcy”. The latest list of filings in the NAMA case against Sean and his wife Gayle is shown above, and can be accessed here (UPDATE: 3rd April., 2013, the Connecticut court service website is not very reliable, you can access the main court page here and try to search civil cases but that part of the website seems to be frequently unavailable). The copy of the motion is not yet online, but it is likely to say that Sean has filed for bankruptcy and that any claim by NAMA should be dealt with by the bankruptcy trustee. You will notice that there are frequent filings in the NAMA case against Sean and Gayle, and that reflects the fact that this case – in which NAMA is alleging shenanigans with spousal transfers, allegations denied by the Dunnes – is being fought tooth and nail by both sides, with NAMA every bit as engaged as the Dunnes. There is a hearing scheduled for Thursday this week, 4th April 2013, and we may get further clarity as to how the case is to proceed. Remember, we’re still waiting to find out whether the judge is going to rule if the US courts have jurisdiction over the Swiss apartment transaction. As we saw on Sunday, Sean did include an certificate from some internet counseling outfit, with his application but it seems that was not acceptable. There is a hearing on Monday next where Sean will be given the opportunity to explain the omissions and to seek to reassure the court that he will rectify matters. Tom Lynch – pictured here – the former Principal Officer in, what was the Department of Justice, Equality and Law Reform and who was appointed in 2006 to run, what was then the National Property Services Regulatory Authority, has failed to deliver again. We were supposed to have a register of all post-Jan 2010 commercial leases by the end of March 2013, but there is absolutely no sign of it, and a request for comment sent to the Property Services Regulatory Authority over the weekend has not been responded to. There is no message on the PSRA website indicating a delay. The bould Thomas has a history of late delivery. In November 2011 he told the Irish Times in relation to the residential property price register that it would be online by June 2012. In the end, we got a surprisingly basic register at the end of September 2012, and people are still picking errors out of it. The March 2013 deadline for fulfilling what is another Troika demand to make the Irish property market more transparent, had been signposted for some considerable time, and Minister for Justice and Equality Alan Shatter has been frequently asked about it in the Dail – for example here and here and here, and when most recently asked about it in the Dail, Minister Shatter indicated that we might be seeing details of up to 20,000 commercial leases. When this Government says that it has met all the targets in the 2010 bailout agreement with the Troika, that’s not totally true; some targets were deferred in agreement with the Troika and some were missed, like the introduction of personal insolvency legislation. So, Thomas isn’t just not delivering in his own organization but he puts in jeopardy the delivery of terms under the bailout agreement. Developments will be monitored on here. This may be the most valuable asset to which NAMA is connected, but alas, we don’t know precisely how much the loan owed to NAMA is on Citi Tower, the headquarters of Citigroup in London’s Canary Wharf. According to Mike Foster at eFinancialNews.com (competitor to Financial Times founded in 1996), a deal to sell the 1.2m sq ft 42-storey 200m-high building is close to finalization at “over GBP 1bn” (€1.2bn), with the buyer identified as AGC Equity Partners, which eFinancialNews says is a Middle Eastern investor. The Citibank building in London’s Canary Wharf is owned by Derek Quinlan and Glenn Maud, the Sheffield lawyer turned investor – both property men are suffering financial distress with Derek Quinlan’s woes well documented, and Glenn Maud is now reportedly living on GBP 500 (€580) per week after the collapse of his Propinvest empire. We don’t know how exposed NAMA is to the building, though given the relatively strong performance of the London office market since November 2009, it may have a fighting chance of seeing a profit on the acquisition value of this loan. NAMA’s Head of Asset Management, John Mulcahy’s former employer, Jones Lang LaSalle (JLL) is handling the sale. The regular audience on here will know that there is little time for the asking price indices produced by Daft.ie and MyHome.ie. When the only alternative was the mortgage-based transaction index from the CSO, the asking price indices had some relevance because we were in the dark on cash-based transactions. But after the launch of the property price register in September 2012, there is really no excuse for paying much attention to asking price indices because we now know what all property – sold to cash-buyers and sold to mortgage-buyers – sells for. What we needed of course is for some organization to take the massive list of sales prices on the new Property Price Register and produce a nice clean index. Remember someone needs to look at an individual sale price, work out what sort of property it is – size, location – and relate it to prices of the same type of property previously. That’s not easy, but the good people at Daft.ie have done it. They’re best placed to do it of course because they have a massive database of listing details which allows them to look at most properties sold and see what the original Daft.ie listing looked like. Well done to Daft.ie for doing this, it’s difficult dirty work and they are providing a true public service with analyzing the data in the Property Price Register and turning it into real information. There are drawbacks with the information on the Property Price Register, there are some errors in the data and it is constantly updated, so you might still find new transactions being added for prior months. 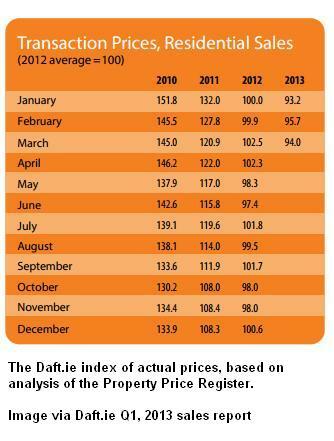 This morning, Daft.ie has produced its latest index on the Property Price Register. The index in March 2013 is 94.0, down 8.3% from 102.5 in March 2012. When calculating the annual decline, what Daft.ie do is to produce an average decline from Q1,2012 to Q1, 2013 and this decline was 6.5%. Daft.ie says that prices in Dublin have fallen 2.4% in the past year, prices in other cities are down 3.7% so that would imply that prices outside cities are falling by more than 6.5%, if 6.5% is the national average. The pace of declines is definitely moderating, the index stood at 145.0 in March 2010, 120.9 in March 2011, 102.5 in March 2012 and 94.0 in March 2013 representing annual declines of 17%, 15% and 8% in 2011, 2012 and 2013. So prices are still declining but at a lesser rate than in 2011 and 2012. Interestingly the decline recorded by Daft.ie’s actual price index from Jan 2010 to date is 39% which is greater than the 30% decline recorded by the CSO. The really good news is that the Property Price Register shows that transactions are substantially up, by a stonking 38% in 2012 on 2011 figures. Daft.ie hasn’t shown 2013 volumes but because of delays in updating the Property Price Register, that omission by Daft.ie is perfectly understandable. But increased transactions show the market is recovering in the true sense that buyers striking more bargains with sellers, even if prices are still declining. The old media is focusing on asking prices. You’ll find the asking price reports for Daft.ie here and MyHome.ie here, if you’re interested. Lisney and DNG also produce surveys of asking prices. Sherry FitzGerald produces a survey of settled prices from its estate agents. There doesn’t appear to have been much reporting in the old media in Ireland about a defamation case initiated last November 2012 by controversial businessman, Denis O’Brien and his telecoms company Digicel, in a Californian district court. The Sunday Times did cover the case in a report in early December 2012 – not available without subscription – but the general absence of reporting is remarkable given the fascinating detail that has so far emerged in court filings. The case was initiated last November 2012 in California by Denis and his telecoms company, Digicel. 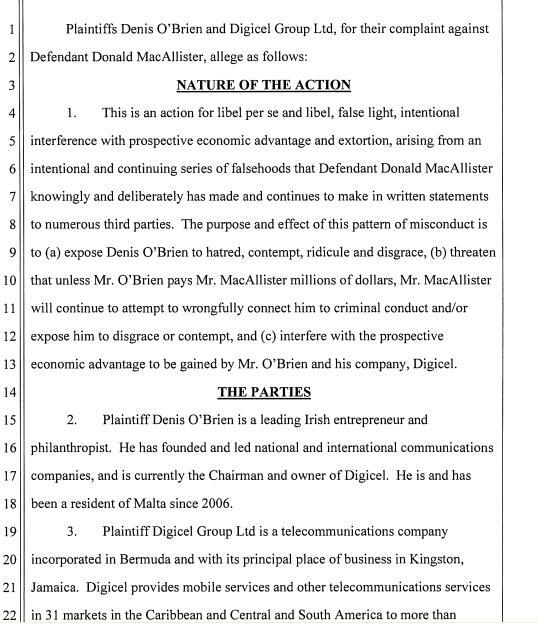 Denis and his company are claiming that an individual named Donald MacAllister has made a series of falsehoods in written statements and Denis’s lawsuit says “the purpose and effect of this pattern of misconduct is to (a) expose Denis O’Brien to hatred, contempt, ridicule and disgrace, (b) threaten that unless Mr. O’Brien pays Mr. MacAllister millions of dollars, Mr. MacAllister will continue to attempt to wrongfully connect him to criminal conduct and/or expose him to disgrace or contempt, and ( c) interfere with the prospective economic advantage to be gained by Mr. O’Brien and his company, Digicel”. For his part, Donald is denying the central allegations, and is saying that Denis owes him money from an investment a decade ago of €100,000 in Digicel. Denis is represented by Neal Potischman of Californian law firm Davis Polk and Wardwell and Donald is presently representing himself. Donald is accused by Denis in the Californian lawsuit of sending emails containing falsehoods to an array of Irish, American, Jamaican and Burmese politicians and media including Fianna Fail leader Micheal Martin, Fianna Fail senator Diarmuid Wilson, #vinb himself Vincent Browne and Burmese Opposition leader Daw Aung San Suu Kyi. 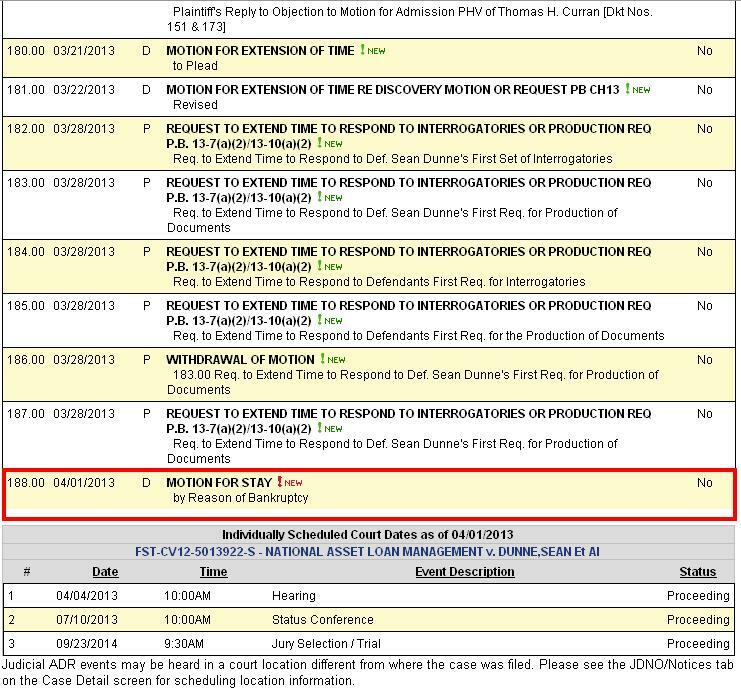 There was supposed to have been a case management hearing last week in California which would schedule a date for the full hearing, but we are still awaiting confirmation of the order from that. We do know that both sides believe the matter will required a 2-3 day hearing, and that Donald is looking for a jury hearing. The 9-year old Donald was travelling by car , a Hillman Hunter owned by Denis O’Brien senior, in Foxrock, south county Dublin on 31st August, 1972 with his mother Maureen driving and brother Niall in the back seat when they collided with a Daimler driven by the then 36-year old Michael Smurfit, now one of Ireland’s richest men. In 2011, Donald wrote an ebook about the crash; the book is available from Amazon here. In his reply to the present lawsuit in California, Donald writes that a report – commissioned by Donald from an outfit called Crash Team Inc, and which apparently had input from a “Mr Finn, the former Head of Ireland’s Forensic Crash Investigation Unit” – said “it is our opinion that Maureen O’Brien (MacAllister) was not speeding, and was not initially on the wrong side of the road. Her motion to the incorrect side was an attempt to avoid the oncoming Daimler which was in her lane when she first detected it. We have concluded this fatal accident occurred as a result of Michael Smurfit speeding, and driving on the incorrect side of center”. There is no corroboration of the claim made by Donald in his answer, and Michael Smurfit has been exonerated by Gardai of fault in the tragedy, though Donald is now saying that he has been discussing a fresh inquiry with Gardai. Sunday Times reporting in 2011 suggests that Michael Smurfit didn’t know until 2011 that the woman killed in the 1972 car crash was Denis O’Brien’s aunt. Donald claims in his reply to the lawsuit, that, in 2009, Denis O’Brien told Donald that Michael Smurfit had financed the first of Denis O’Brien’s forty radio stations. The Clinton Foundation lists contributors to the Foundation and lists just five contributors who’ve donated more than USD 25m and they are “Bill & Melinda Gates Foundation, Fred Eychaner, Frank Giustra, Chief Executive Officer, The Radcliffe Foundation, The Children’s Investment Fund Foundation and UNITAID. There is a “Denis J O’Brien” who contributed between USD1-5m, and Digicel’s Denis’s second name is “John” but that donation, although significant, wouldn’t be enough to qualify Denis as the “largest contributor” to the Clinton Foundation.